There are many reasons to like Airborne Toxic Event. As I have written in the past, the band plays an infectious alt/rock style that pulls influences from the 80s and mixes these influences with theatrical vocals and riffs. This amalgamation creates an intriguing aura of orchestral sound that echoes and pulses. The music is also “smart” rock. It’s a neoteric genre. Let’s be honest; a lot of music today is, well, nescient – intellectually dumbed down for an audience that just wants to hear a consistent beat. That is not to say that the producers and creators of the music are unintelligent – they are simply playing to what will make money. But Airborne Toxic Event is different. The band is made up of uber-talented musicians who understand how to mix “smart” rock with infectious rhythms. I initially became interested in the band because of lead vocalist Mikel Jollett. Jollett, a fiction and freelance writer, began seriously writing songs after a string of moribund events in his life. He named the band after a tremendous section of my favorite Don DeLillo book “White Noise.” The life-altering events that engendered the band’s creation are similar to “The Airborne Toxic Event” portrayed in DeLillo’s masterpiece. Thus, as a writer, Jollett’s lyrics are laden with symbolism and passion. The Airborne Toxic Event, fresh off the release of its new album Such Hot Blood, will join a large Summerstage crowd in Central Park (5th Avenue and 72nd Street entrance) on June 18. Best of all – the concert is FREE. Yes, free as in no money. The band will be joined by The Calder Quartet, a LA-based string quartet, who have been called “outstanding” and “superb” by the New York Times. So, yeah, free Airborne Toxic Event show with The Calder Quartet in Central Park – you should probably come. “The Fifth Day” is one of my favorite songs off of the new album. The song features one of my favorite Airborne Toxic Event elements. The music is almost subtle. While you can drown in the elaborate instrumentals and production, the music progressively rises and falls like waves before ultimately crescendoing. In this case, the music perfectly matches the melancholic lyric. 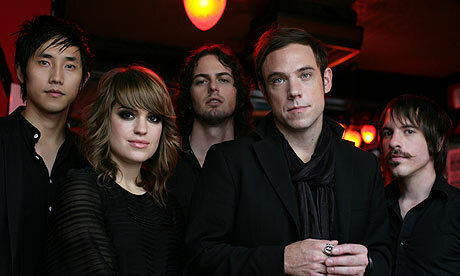 Check out more about the Airborne Toxic Event and don’t forget to keep track of the diverse Summerstage schedule!